Asus Swift 5 has a 14-inch full HD display with narrow bezels on all corners with an overall footprint of the notebook similar to that of a 13” notebook. weighs just 970gms. 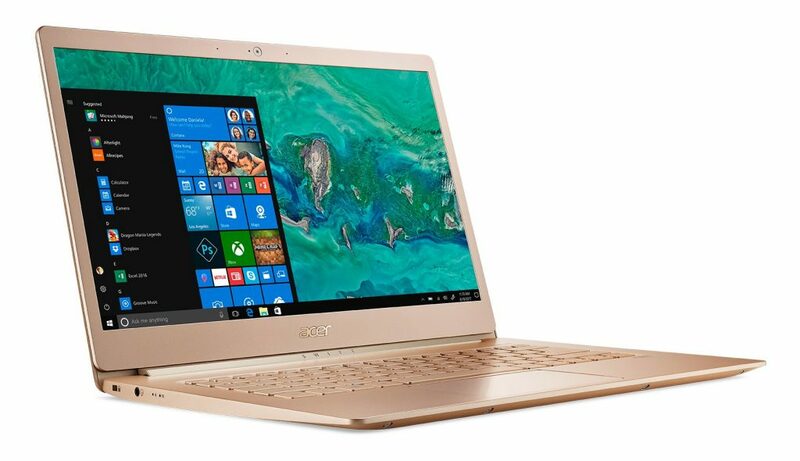 Acer Swift 5 is just 14.9 mm thin allowing for splendid portability and it is built of ultra-light magnesium-lithium alloys for the top and bottom cover, and magnesium-aluminum alloys for extra sturdiness on the palm rest area. It comes with Acer Color Intelligence technology that optimizes screen color, brightness, and saturation resulting in much vivid and brilliant colors letting you enjoy movies and video content. Acer Swift 5 packs Acer’s TrueHarmony technology with Dolby Audio Premium technology that provides powerful and clear audio. It runs on Windows 10 and has support for Cortana. It packs 8GB DDR4 RAM and 512GB SDD storage. The company is promising an 8hrs battery back-up. Connectivity features include 2×2 802.11ac WiFi provides, Dual USB 3.1 Type-C ports and also includes a fingerprint reader. Acer Swift 5 starts at Rs. 79,999 and will be available from Acer Exclusive stores and other leading retailers.